I started the New Year making some family favorites. 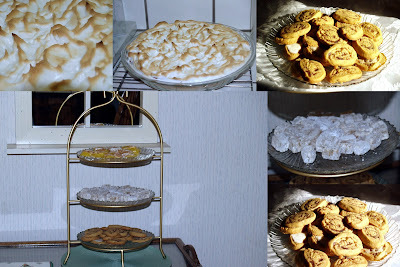 Lemon Meringue pie, Lemon squares, Date-Nut Pinwheel cookies and Fruit Delights. January is my month for organizing. Today the Christmas decorations are being stored away and Cozy Corner items are being put into totes by month and stored. I am so excited. I love a new fresh start every year. Welcome 2010. At last! Here I am looking at your blog. I love it and you've impressed me. I'll keep the info on getting to the blog so I can check it every so often. Keep up the good work.